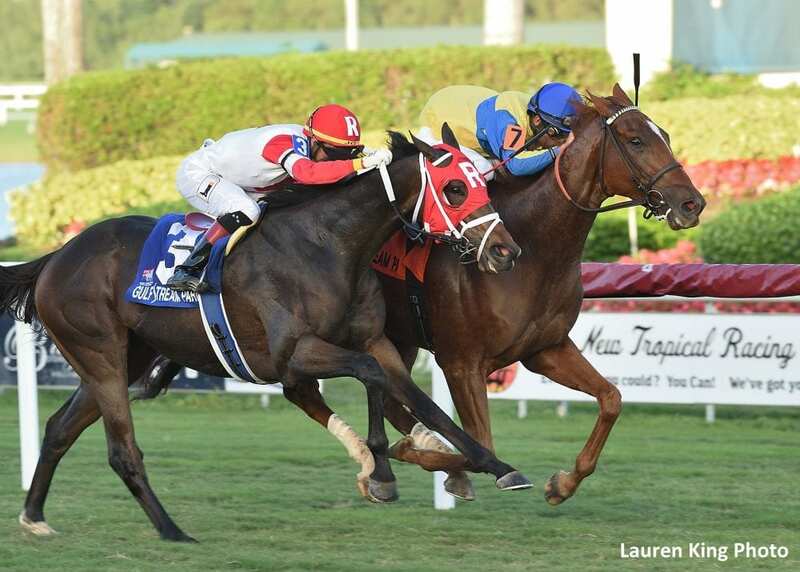 Trinity Farm's Red Knight made a five-wide swoop to the lead entering the homestretch and held off favorite Soglio by a head in Saturday's $100,000 H. Allen Jerkens at Gulfstream Park. The two-mile stakes honoring the memory of the legendary Hall of Fame trainer headlined six turf stakes on Saturday's 11-race program. “Luis made a tactical move leaving the backstretch. He got the jump on the favorite, who looked like he had a little trouble. It worked out well for our horse,” said Ken McCarthy, Mott's longtime assistant. Takaya Shimakawa's Si Que Es Buena visited the winner's circle for the first time in the U.S. Saturday after scoring a victory in the $75,000 Via Borghese for fillies and mares on turf. This entry was posted in Racing and tagged bill momtt, chris landeros, equal stripes, Gulfstream, gulfstream park, h. allen jerkens, h. allen jerkens stakes, hall of fame, holy helena, puero, pure prize, red knight, Si Que Es Buena, soglio, via borghese stakes by Press Release. Bookmark the permalink.